Come and experience the thrills of Disney’s California Adventure Park®, a separate park adjacent to Disneyland®. With plenty of choices both for kids and adults alike, families will never run out of favorite rides to go on and shows to see. 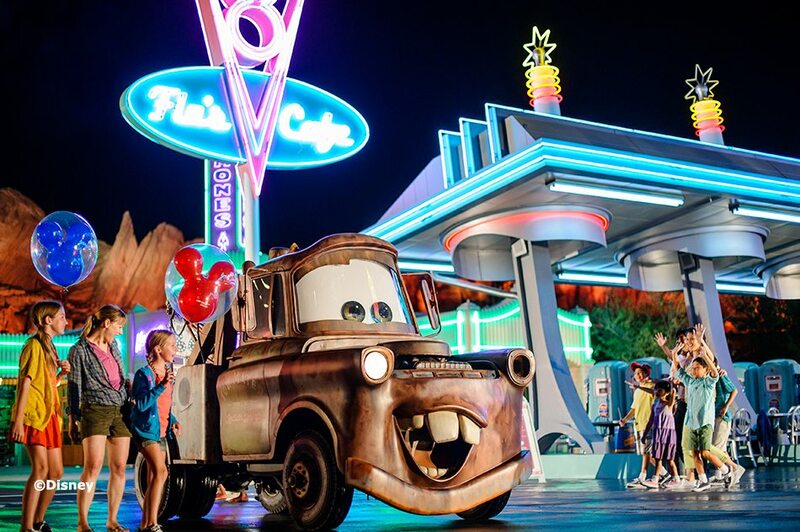 Explore the wonders of Cars Land™ and take a ride through Mater’s Junkyard Jamboree™. See the magic from above with the famous Pixar Pal-A-Round™! With numerous dining options right inside the park, including favorites like the Boardwalk Pizza & Pasta, Clarabelle’s, Corn Dog Castle and the Cozy Cone Motel, there is food to please everyone along with a little magic and adventure while you eat. With several fun-filled shows to see including The World of Color™ and Disney Junior-Live on Stage™, who says you can only ride the rides to have a great time? Our Anaheim hotel knows that your main purpose here is to experience everything this area has to offer, which is why we provide all the comforts of home to make sure you have the best trip possible. There are plenty of shopping options within walking distance of our hotel, including the Garden Walk with plenty of restaurants and shopping. If you feel like relaxing with a movie after a long week of exploring the parks, check out the nearby AMC 12 Theater at Downtown Disney®, just a short walk away. No matter what you choose to do on your vacation, our Anaheim hotel provides you with a central location to easily get everywhere you need to go.